In cooperation with state and local partners, the Department of Labor is setting aside funding and will be making grants to assist in disaster response efforts after Hurricane Irma. The Department has initially committed up to $40 million in Disaster Dislocated Worker Grant funding to Florida, Puerto Rico, and the U.S. Virgin Islands. The amount of total funding may increase as the needs and impacts on state and local partners are assessed following the hurricane. OSHA is actively engaged with the National Response Team and the interagency response to the hurricane and flooding. It is working with the Federal Emergency Management Administration, the Environmental Protection Agency, the Department of Homeland Security, and other federal agencies to coordinate strategies for the recovery. As the severity and extent of the damage becomes known, the Department will monitor activities and take additional actions as necessary. For more information on the Labor Department’s assistance to those recovering from Hurricane Irma, see the news release. OSHA is also working closely with local, state, and federal response partners to protect all workers involved in Harvey cleanup and recovery operations. At FEMA’s request, OSHA staff joined the Joint Field Office in Austin, Texas, and is developing an incident-specific health and safety plan to protect workers during the cleanup and recovery operations. 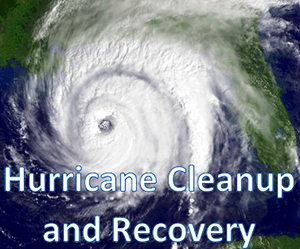 OSHA has been planning and conducting outreach with interagency partners and stakeholders by providing worker safety and health resources, such as the agency’s preparedness, response, and recovery webpages on hurricanes and floods. To date, OSHA staff have conducted dozens of interventions in the Coastal Bend area to assist employers and workers in identifying unsafe or potentially unsafe working conditions. OSHA response teams have removed approximately 350 workers from hazards, and provided outreach at shelters and work camps where workers assembled and began preparing for recovery activities. What is an OSHA Intervention in Time of Emergency? 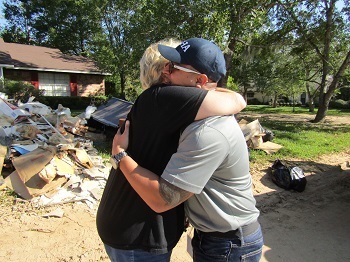 A resident of Friendswood, Texas, hugs OSHA inspector Simon Cabello in gratitude for the help the agency provided her and her husband during the Hurricane Harvey recovery efforts. 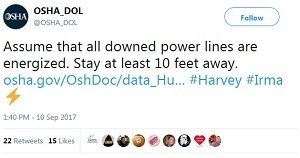 On September 9, a team of OSHA responders offered assistance to contractors, volunteers, and residents in Friendswood, Texas, who were recovering homes devastated by the floods from Hurricane Harvey. 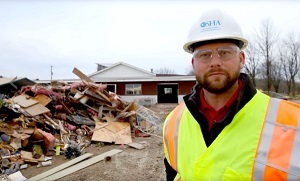 OSHA’s Simon Cabello and Justine Callahan provided volunteers from a local community church with personal protective equipment such as safety glasses and respirators for the work they were doing. The OSHA team focused on safety and health precautions, but offered help to local residents in other ways when needed. While doing their outreach, an elderly couple told inspectors Cabello and Callahan that they didn’t have flood insurance and they weren’t sure how to get information from the Federal Emergency Management Agency. The OSHA inspectors connected the homeowners with a FEMA representative, who met with them to assist in their recovery efforts. The Mason Contractors’ Association of St. Louis and OSHA have renewed a strategic partnership to reduce injuries among area masons. Through the partnership, the total OSHA case incident rate among association members has dropped by 36 percent over the past three years. The association’s rate of serious injuries is also 25 percent below the industry average established by the Bureau of Labor Statistics. The partnership will continue to focus on developing effective safety and health training programs, identifying and preventing hazards, and encouraging worker participation in safe work practices. For more information, see the news release. The American Chemistry Council signed a two-year agreement to promote a culture of safety and health by providing its members, occupational physicians, and stakeholders in the polyurethanes industry with training resources to protect workers from exposure to hazardous diisocyanates. For more information, see the news release. The National Grain and Feed Association signed a two-year agreement to protect the safety and health of workers in the grain handling industry. The alliance will focus on preventing exposure to hazards associated with grain bin entry, machine guarding, respiratory protection, falls, heat, combustible dust, struck-by equipment, and lockout/tagout. For more information, see the news release. Before contacting Oregon OSHA’s On-Site Consultation Program, roofing system manufacturer Duro-Last Inc. had a serious injury rate at its Grants Pass facility that was approximately twice the industry’s national average. Through the program, Duro-Last reduced its serious injury rate to nearly one quarter of the industry average. The company not only improved worker health and safety, but also bolstered its production and profitability. The company’s safety successes first led to its acceptance into Oregon OSHA’s Safety and Health Achievement Recognition Program. Recently, it became the state’s newest Voluntary Protection Programs Star Site. VPP certification is designed for exemplary worksites with comprehensive, successful safety and health programs. For more information, read Dura-Last’s success story. OSHA initiated an inspection of Hometown Foods USA after receiving a complaint of unsafe working conditions. Inspectors cited the commercial bakery, doing business as Bagelmania Inc. in Medley, Fla., for 16 safety and health violations, including failing to: ensure proper machine guarding on equipment; provide personal protective equipment; develop a lockout/tagout program to prevent machines from unintentionally starting; and develop a hearing conservation program. OSHA proposed penalties totaling $129,145. For more information, read the news release. California OSHA issued five citations and $51,160 in penalties to Aero Pacific Corp. in Placenta for safety violations after a worker was struck and killed by a moving spindle. Inspectors determined that, among other violations, the company failed to identify and correct machinery hazards in the workplace, and train workers on the control of hazardous energy. In a separate investigation, Cal/OSHA issued five citations and $68,435 in penalties to RWC Building Products in San Marcos following the death of a worker who fell from a truck-mounted conveyor belt. Inspectors concluded that the company failed to ensure that workers were wearing approved personal fall protection equipment while unloading material onto a roof, did not perform periodic inspections to identify unsafe conditions and work practices at different job delivery sites, and failed to provide effective training for supervisors to recognize safety and health hazards. Our comprehensive guide to Training Requirements in OSHA Standards is a valuable reference to help employers, safety and health professionals, and training directors comply with the law and keep workers safe. However, at more than 250 pages, the printed version can be cumbersome to carry on some jobsites. That’s why the guide available in digital (MOBI and EPUB) formats; it can be read on a smartphone or tablet and easily searched for the standards that apply to specific industries or activities. Visit OSHA’s website to download a copy. As a result of a joint alliance with the Consulate of the Philippines, OSHA’s Job Safety and Health−It’s the Law poster is available in the Tagalog language. The poster, available for free from OSHA, informs workers of their rights under the Occupational Safety and Health Act. All OSHA-covered employers are required to display the poster at their workplace in a conspicuous place where workers can see it. The poster is now available in 11 languages.